A lunar month takes 29.53 days. This is the amount of time it takes for the Moon to complete a cycle through all the phases, from new moon to full moon and then back to new moon again. This is very close to the length of a month in the Western calendar, which usually have 30 or 31 days. Every month usually has one of each of the phases. So a typical month will have a new moon, first quarter, full moon and last quarter moon. But every now and then, a month will have two of the same phases. When a month has two full moons, the second one is called a “blue moon”. Blue moons are rare, and that’s where the phrase comes from, “once in a blue moon”. How rare? They always happen once every 2-3 years (2.72 years, to be exact). It’s this second moon in the month that’s considered the blue moon. Does the blue moon actually turn blue? No. 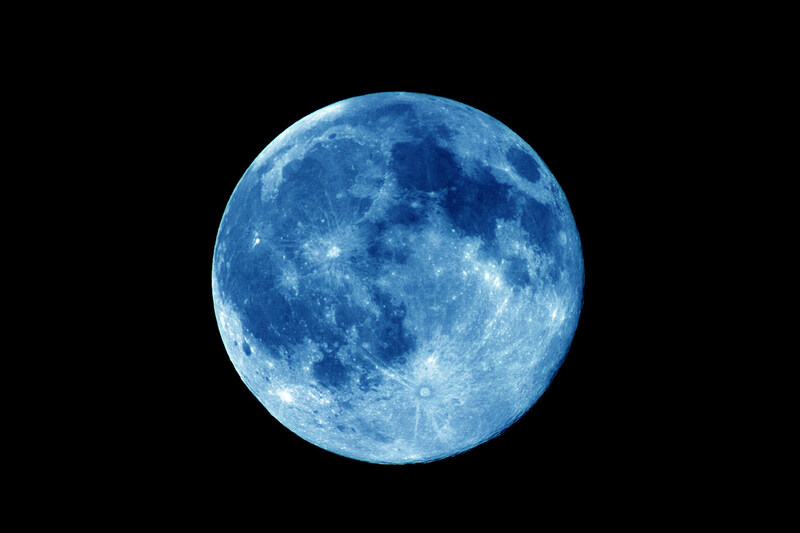 A blue moon is exactly the same color as a regular full moon – yellow. The Moon can turn blue when there’s a certain amount of dust or pollution in the air. The extra dust scatters blue light, making the Moon appear more blue. For example, the Moon appeared blue across the entire Earth for about 2 years after the eruption of Krakatoa in 1883. We have an article here on Universe Today about all the phases of the Moon. Here’s an article from NASA about blue moons. The complete story is so tortuous that one would have to place here the entire article in order to allow a full understanding, but maybe a few passages will help. “In Sky & Telescope’s March issue (page 52), folklorist Philip Hiscock traced the calendrical meaning of the term ‘Blue Moon’ to the Maine Farmers’ Almanac for 1937. But a page from the almanac (…) belies the second-full-Moon-in-a-month interpretation, as Donald Olson and Roger Sinnott pointed out in a companion article that called for further research. “(…) we have now obtained more than 40 editions of the [almanac] from the period 1819 to 1962. These refer to more than a dozen Blue Moons, and not one of them is the second full Moon in a month. What’s going on here? “(…) We found that the Blue Moon definition employed in the [almanac] is (…) based on the seasons (…). “Instead of the calendar year (…) the almanac relies on the tropical year, defined as extending from one winter solstice (‘Yule’) to the next. Most tropical years contain 12 full Moons –three each in winter, spring, summer, and fall– and each is named for an activity appropriate to the time of the year (such as the Harvest Moon in autumn). But occasionally a tropical year contains thirteen full Moons, such that one season has four rather than the usual three. “(…) When a season contains four full Moons, the third is called a Blue Moon. Read the article and find out. I don’t want to spoil the fun…unless you ask for it. Previous PostPrevious What is a Waning Moon?